Preparing to hunker down for the cooler months? Feeling gloomy about the end of summer? Stop right there! If Susan’s last post on Vitamin D and dementia didn’t get you up and out, then tune in to this week’s BBC Horizon programme (http://www.bbc.co.uk/iplayer/episode/b04g507y/horizon-20142015-5-allergies-modern-life-and-me) on the explosion of allergies in the developed world. Horizon covered not only the role of eating a wide range of fruit and veg to up your intake of prebiotics but also the importance of getting your family outside – in order to reconnect with microbiota (sun or no sun). Today, almost a third of the Western population have allergies and the link between allergies and poor gut bacteria now seems irrefutable, with mounting evidence that the same lack of microbiota could also be responsible for the rise in inflammatory disease. The blackberries are fantastic this year, so get out and combine foraging for nutrient-rich berries with upping your gut bacteria, increasing your vitamin D, and getting some exercise. Need another reason to exercise? Recent research from Cambridge University found exercise to be the most significant protector against dementia, with just one hour a week reducing the chance of getting Alzheimer’s by half. (http://www.telegraph.co.uk/health/healthnews/10964854/One-hour-of-exercise-a-week-can-halve-dementia-risk.html). And breaking news today shows walking can cut your risk of a cancerous death by 50% (Read more here … http://www.dailymail.co.uk/health/article-2737274/Walking-mile-day-cuts-cancer-death-risk-half-Physical-activity-described-wonder-drug-breast-prostate-patients.html). I always have peas and soybeans in my freezer and jars of red peppers and sun-dried tomatoes (rich in lycopene) in my store cupboard for those nights when there’s nothing in the fridge and I only want to spend ten minutes in the kitchen (I know there’s debate about soy but it’s about processed soy not the whole soybean which is rich in fibre, calcium, magnesium, iron and protein). You can throw any herbs (or none) into this dish. I often serve this salad, still warm, with a small piece of wild salmon (which I also keep in my freezer at all times) or a hard-boiled egg – and some watercress or baby spinach. Chopped herbs, spring onions etc if you have to hand. 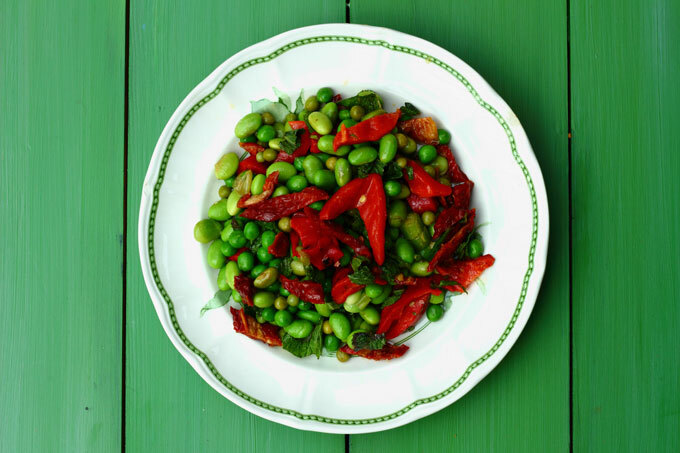 Cook the peas and soybeans for 3 minutes, toss in the snipped peppers and tomatoes and chopped herbs. Drizzle over olive or avocado oil and lemon juice (one part lemon juice to three parts oil with the zest too) or your preferred dressing. Hi .Your pea and soya been salad looks great.I currently buy a smal tub of soya bean, broad bean and French beans in a mint Japanese vinegarette which I love from the chiller in the supermarket.However not the additional preservatives,sugar and the price.At present I am trying to make a similar vinegarette myself .Any ideas please ?You suggest salmon as an accompaniment .However my taste buds dislike fresh salmon in any shape or form,although I love Bear and Wolf premium skinless,boneless wild Alaskan salmon in a tin. You could try mackerel as an alternative to salmon – or even trout? All are the wonderful oily fish we need to eat once or twice a week. For the japanese dressing, you could try the dressing i use on our red cabbage slaw or carrot and sesame salad. https://agewellproject.com/why-caring-for-others-and-red-cabbage-could-prolong-your-life/ and https://agewellproject.com/cancer-busting-carrots-simple-carrot-salad-sesame-dressing/ Reduce the maple syrup (peas are quite sweet so will need less) and add fresh mint. Good luck! Thanks for your comment. What a lovely recipe – I have printed it out for my kitchen favourites. I do love soy beans, and baby broad beans, and always have them in the deepfreeze, so now must try and find bottled peppers and a bottle of sun-dried tomatoes. Are sun-dried tomatoes really so much better for you than fresh tomatoes? Apparently so – i like bottled dried tomatoes in oil but you can also buy them dried and re-hydrate in a little warm water. I leave out the peppers if i don’t have any… It’s such a flexible recipe so do experiment and make it your own! Thanks for your comment.